A new investor report from J.P. Morgan on Wednesday indicates that Apple's competitors in the tablet market have reduced their build plans after receiving an "early dose of reality" in the form of lackluster sales. According to analyst Mark Moskowitz aggregate tablet build plans have declined by roughly 10 percent since early March. Moskowitz took the reduction to mean that "non-Apple tablet hopefuls have adjusted to the weak showing so far." Describing the trend as an "early dose of reality," the analyst noted that the market has yet to see a high-volume tablet competitor to the iPad. Moskowitz cited Asusteks Eee Pad Transformer, Motorolas XOOM, RIMs PlayBook, and Samsungs Galaxy Tab as examples of tablets that have failed to gain traction and whose makers have consequently reduced build plans. In early March, Moskowitz warned of "increasing risk of a bubble burst" to the tablet market in the second half of 2011 because of exaggerated build plans from tablet makers. Moskowitz saw Apple's iPad 2 as making it tougher for rival first-generation tablets "to play catch-up," which would result in poor sales. The recent reduction in production volumes has allayed some of the firm's fears of a tablet bubble. Moskowitz acknowledged that extrapolating trends from build plans can be problematic, noting that the firm applies discounts to adjust for limitations. 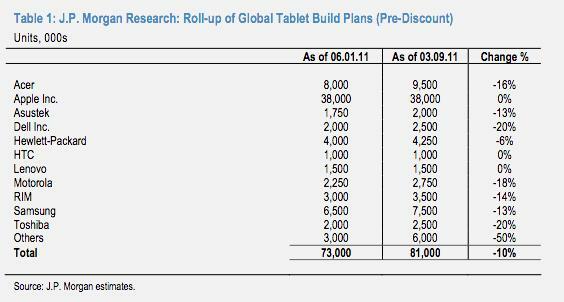 J.P. Morgan now projects 2011 build activity for the tablet market to come in at 63 million after a discount of 14 percent. The firm had previously applied a 20 percent discount to arrive at a 65 million unit estimate, but reduced the rate after tracking "widespread reductions in build activity" in recent months. According to the analyst, the "nascent tablet market stands to become big enough to create a ripple effect in the broader tech food chain" in 2011. Total tablet shipments in 2011 will reach just 3 percent and 11 percent of total handset and smartphone units, respectively. However, when compared against desktop and notebook PC units, tablet shipments will reach 32 percent and 21 percent respectively. Thus, "tablets stand to be big enough to have positive (or negative) spillover effects" in the broader market, Moskowitz said. Moskowitz sees "limited upward pressure" in build activity occurring throughout the summer, adding that any increase will likely come from Apple. Some tablet makers are waiting to "see how the back-to-school reception is," while others are waiting to roll out 4G LTE tablets, he said.